Civilization is Sid Meier's masterpiece. Oh, I was talking about the computer game. How many weeks of my life have I given to that genius creation? Not content with that, Mr. Meier has ported his creation to board game format. If you've played the computer version of Civilization, you will be able to figure this game out quickly. If you haven't, there is quite a bit to digest. Each player builds cities, armies, cultures, and yes, whole Civilizations. By balancing your economy, technology and military you attempt to become the leading Civilization in the world. Sound epic enough for you? 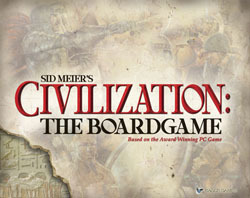 Sid Meier's Civilization: The Board Game really can be epic. Start off with the over 700 plastic pieces to cut out. Even set up takes a while, and a lot of space as you have a huge, beautiful board and many cards and pieces to lay out. The board depicts the Earth and you're going to start with a lonely Setter to start. That little guy will look for a good place to build a city, and your Civilization is officially established. The full rules (in both Standard and Advanced versions) are a little too long to go into exhaustive detail here. So I'm going to give you a broad outline and then point you to the Eagle website PDF file including the entire rulebook. So, you've got a city started. You begin in the Ancient Era. How to improve your civilization? You will be buying technological advances. These advances will give you more options to improve your cities and buy more advanced units. For example, when someone buys Mysticism, all players gain the ability to build a Temple. But the one who purchased the technology gets the associated Wonder of the World. Wonders give you benefits that are, well, wonderful. Just like the pooter game, technology advances depend on one another. So, no one can buy Iron Working until Bronze Working has already been purchased. Once someone has climbed the technology tree far enough, the first technologies of the next era become possible. As soon as someone buys a technology of the next era the current era is finished. Wonders stop working, new military units become available, and ALL city improvements are discarded. Yep, you gotta re-buy the new versions for this era. Some of these technological advances will allow you to buy military units. For example once Bronze Working is bought, all players may buy Spearmen. The types and power of units progress and new technologies and new Eras dawn. Now when your military units cross path with other players', battle can take place, using the kind of die-rolling you're used to in these big-board struggles. Standard rules games end when one player owns 3 technologies of the Modern age. Advanced games offer the diplomatic/military/technology the computer gamers will recognize. Vistory points are awarded for the size and number of cities, technologies and Wonders, and the advanced game gives bonus points for the different special endings. Who should buy Sid Meier's Civilization? And that's all I'm going to say for now. Civilization is a big game, and we just can't repeat a 32 page rulebook here. But you can read it at board game geek if you're interested. But I will add that many of you will be thinking "Yes! That's my kind of game!" And then there are others who already know they don't want to buy this game. So I will just say, for those of you not decided, Civilization is a truly great game. It's not perfect by far, but the scope, the feeling and the experience are all that of a superiour game. Like the computer game, this box will fill many evening with dreams of glory. Finally, a boardgame version of this award-winning PC strategy game. Create a civilization to stand the test of time! The game begins in 4000 BC where the players found the first small settlements of a fledgling people. - Explores the world around them, discovering resources, terrain, treasures, technologies, and minor civilizations. -Expands by sending settlers out to create new cities. -Researches new technologies to gain advantages over the other players. -Builds unique “Wonders of the World”. -Increases the size of their cities (4 sizes from village to metropolis) to increase production. -Builds military units to defend what’s theirs, and to conquer what’s not. -Builds city improvements to increase “happiness” or “productivity” in their cities. -Trades with other civilizations to create new wealth. - 2 sets of rules (Standard, and Advanced) allow anyone to play and enjoy the game. - 784 professionally sculpted plastic playing pieces that represent cities, settlers, armies, navies, and air units from 4 different eras (Ancient, Medieval, Gunpowder, and Modern). - 78 full color Technology and Wonder cards. - A giant 46” x 36” gameboard featuring the artwork of Paul Niemeyer.